I happened to come across a domain name owned by Mike Mann’s Domain Asset Holdings, and I noticed the company recently changed its landing pages. A cross check with some other DAH landing pages confirmed this. The changes between the new landers and old landers are pretty distinct, and because Mann is often on the leading edge when it comes to domain acquisitions and sales, I think it’s something others should note. As you can see in the embedded image above (and by visiting an example like PublicEmployees.com), gone are the PPC links that were usually shown. 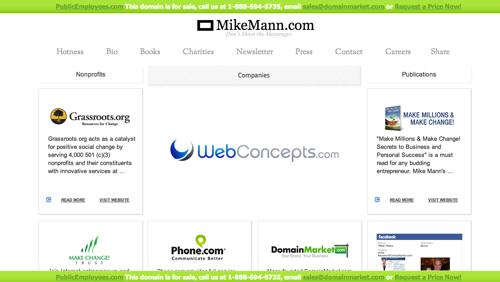 In its place are links to Mann’s businesses like SEO.com, Phone.com, DomainMarket.com, and many others. In addition, links to Mann’s charitable causes are also prominent. According to Mann, this was a business decision because it is more profitable to upsell and cross-sell his products and services than to earn revenue from the PPC links that were previously on the landing pages. “If we merely sell a few accounts at our other companies with all that traffic its much more valuable,” said Mann. It’s no surprise that there are brightly colored for sale links and contact information for people looking to purchase one of the domain names. I’ve heard from a couple of people that offers on domain names parked at Frank Schilling’s Internet Traffic are considerably greater than before, likely because of the bright orange strip at the top announcing a name is for sale, and I would imagine the bright green call to action on Mann’s domain names will ensure offers continue to come in to his sales team. It will be interesting to see how long this change lasts, and it will also be interesting to see if other tests are in the works. It seems like a bold move from Mann though. As I mentioned a week ago, I am on vacation until the end of July and comments may take a bit of time to be published. Looks like some of his domains are still resolving to other type PPC/Affiliate landing pages. I suspect they might be parked with FS parking program? Unless of course Mozzarellacheese.com changed hands recently? The current landing page for that particular domain looks nothing like it did as recent as a fewl weeks ago, nor like the current one’s you pointed out? Sounds like a bad strategy to me. Mike Mann has never been particularly good at monetizing park pages, selling domains is his skill.